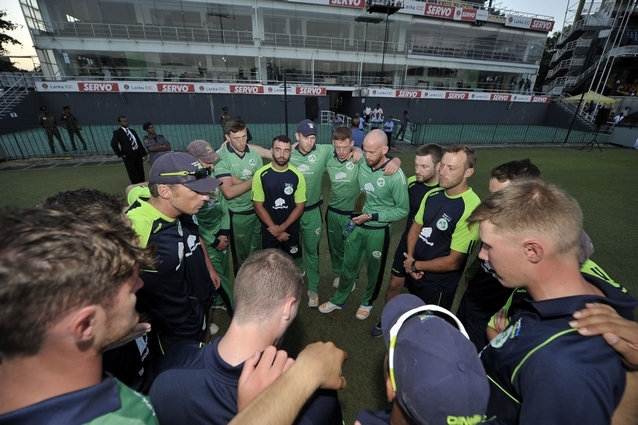 COLOMBO – The Ireland Wolves have scored more than 300 runs in a run chase for the second time in the current one-day series, but have fallen to defeat by 101 runs against a rampant Sri Lanka A at the R. Premadasa Stadium in Sri Lanka. After winning the toss, the home side batted first for the fourth time in five matches. In-form openers Avishka Fernando (112 runs from 94 balls) and Upul Tharanga (120 runs from 108 balls) put on a 206-run opening stand to bat the home side into a dominant position. The Wolves bowling unit struggled to contain the scoring rate, however one bright spot was the spin of 21-year old Gareth Delany. Delany took 3-58, and was on a hat-trick at one stage after removing the dangerous Tharanga and then Asela Gunaratne (25). Sri Lanka A finished with a flourish, ending their innings on 403-7, setting the Wolves an indomitable target for victory. The visiting sides batting unit were determined to end this tour with a positive display and posted 302 in response. 18-year old Neil Rock hit a breezy 78 from 56 balls, including five fours and four sixes, while Lorcan Tucker hit 53 runs - the third time he had passed 50 runs on this tour. James McCollum (43) and Simi Singh (41) also made good contributions, but the target proved too high and the Wolves lost their tenth wicket on the last ball of their 50 overs.